As I mentioned in my previous post, the next two weeks of the cookbook challenge moved to Chloe Coscarelli’s two books. If you’re from the UK you might not know that Chloe became famous for winning the US programme Cupcake Wars, up against bakers who use eggs and dairy (and who by the way were pretty bitchy about Chloe and veganism in general). Like Vegan Diner, I used this book a fair bit when I first got it but also knew I had other things pencilled in to try, so it was an excellent choice for me. 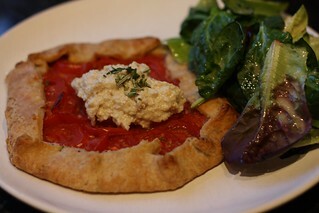 The first recipe I tried was the Rosemary Tomato Galette with Pine Nut Ricotta. I’m a dreadful wimp about making pastry so this pushed me out of my comfort zone a bit. I needn’t have worried though, because it worked like a dream. It helped that you don’t have to use a pie dish or anything, so it can be a bit free form! I really enjoyed the galette a lot and will make it again. I wasn’t so sure about the pine nut ricotta – there wasn’t anything wrong with it, but I have other much cheaper ricotta recipes I like better. By the way, if you’re planning on making this, be sure you plan ahead for all the time the pastry has to go in and out of the fridge. I didn’t and ended up eating very late! I served a salad with the galette and so just for consistency I used Chloe’s shallot dijon vinaigrette which was nothing revolutionary but tasty. 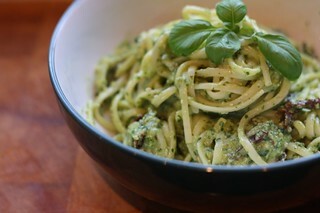 Next up was the Avocado Pesto Pasta. This was a great dish to make in a hurry when I got in from the football and I’ll definitely make it again. I love pesto in any form so throwing avocado into it can only improve it as far as I’m concerned. I used the optional sun dried tomatoes and enjoyed the addition. 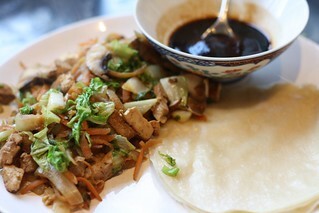 Next recipe on my list was the Moo Shu Vegetables with Chinese Pancakes. Chloe includes a recipe for the pancakes which I’m sure would improve the dish dramatically but I had some store bought Chinese pancakes in my freezer which had been there forever so I decided to use them instead. This meal was just OK for me. The vegetables were a bit bland and I added quite a bit of Sriracha while I was eating. Probably won’t make again. The next dish I tried was probably the biggest surprise of the recipes I picked during the challenge, the Drunken Noodles with Cashew-Shiitake Broth. It was a simple dish to make and looked like it might turn out a bit bland, but I really loved it. 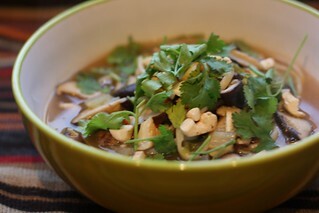 The chewy shiitakes and creamy cashews worked together very well, and it was very quick to put together. 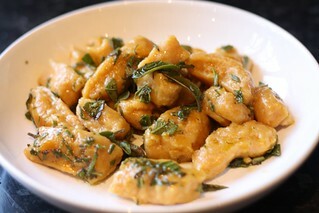 Finally, I made the Sweet Potato Gnocchi with Sage Butter. I baked and mashed the potatoes in advance so although it was a bit fiddly it didn’t take too long to throw it all together. I have a huge sage bush in my garden so I’m always grateful to find ways to use it, and it is an excellent partner for sweet potatoes. I got a bit distracted and overcooked them a touch which made them a bit dense but I didn’t mind that and I enjoyed them. I’m the only one who likes sweet potatoes in this house so I threw the rest into the freezer in individual portion sizes and look forward to enjoying them when I need something quickly. So I made 5 recipes for this challenge, 6 if you include the salad dressing, with good results. I don’t think I’ve blogged about any of the other things I’ve made, which are: Sea Salt and Vinegar French Fries, Avocado Toast, LA Style Chimichurri Tacos, Garlic Bread, Spaghetti Bolognese, and Country Meatloaf with Golden Gravy. My meatloaf wouldn’t firm up at all and the bolognese was very rich, but everything was tasty. I still want to make the Drivethru Burgers, the Falafel Sliders, the Portabello Panini and the Mongolian Seitan. The book itself is very well produced with lots of appealing photographs. I could do with a few less photos of Chloe and more of the food, but that’s a minor gripe, and I’m positive that if you have a sweet tooth Chloe would see you right there too!